Hey! Panda lovers make sure you take note and mark your calendar because the 1600 Pandas along with the “Father of 1600 Pandas” Paulo Grangeon were in Malaysia. These are the paper marche panda, aren't they adorable? 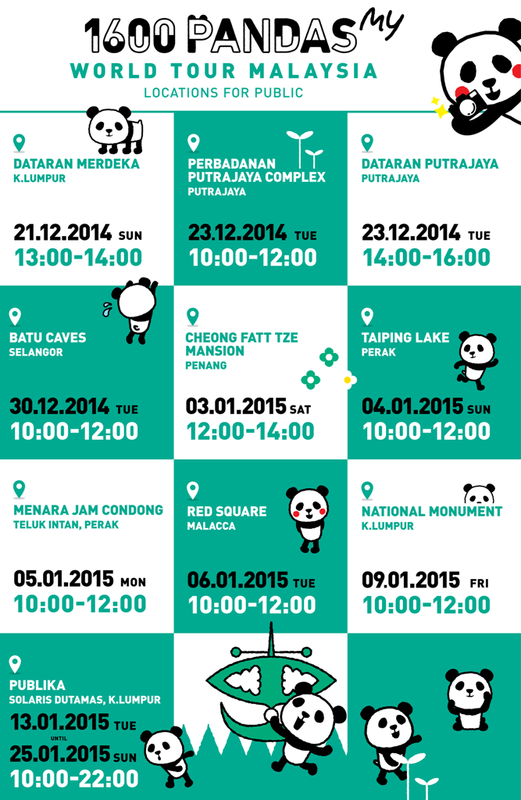 The 1600 Pandas will stop at more than 15 iconic locations in Malaysia until 25th January 2015. Last Sunday morning I was at 1600 Pandas World Tour in Malaysia Welcome Launch at Dataran Merdeka, Kuala Lumpur. The 1600 Pandas World Tour is a creative and artistic way to promote conservation. The growing issues of deforestation is a topic of concern amongst many eco-friendly organizations. Home to many endangered species, Malaysia is a country that reflects the need of continuous sustainability of its wildlife and habitat. Panda is an endangered species, the 1,600 papier mache pandas in various poses, emotions and sizes using recycled paper, as a symbolic representation of the amount of pandas left in the wild. The grand finale of the 1600 Pandas World Tour in Malaysia will take place at Publika from 13th to 25th January 2015, where you can take the opportunity to check out the pandas and take a closer look. This will be the first and only chance for you to take pictures and spend time with the 1600 Pandas in Malaysia. The 1600 Pandas will be available for adoption, where you can adopt the papier mache pandas at RM150 each and have one of the adorable pandas for yourself. Registration of interest (ROI) will begin on 12 January 2015. The 1600 Pandas World Tour which started in 2008 as a collaboration between WWF and Paulo Grangeon has since appeared in more than 100 exhibitions across various countries such as France, the Netherlands, Italy, Germany, Switzerland, Taiwan and Hong Kong. Malaysia is the 1600 Pandas 3rd stop after Hong Kong in Asian region. nice nice! Can you get 1 panda for me too :3? HoHoHo Merry Christmas! First time to see in photo, more pandas! More good people are doing it for a cause. Hope it'll get positive results. Awww send those cute Pandas here. I;m sure my kids will love them! Looking forward to visit Malaysia soon. Oooh super cute! I wish they will find their way to Jakarta too :D Would love to see them here. I want to adopt one panda also! Adorable. I hope they visit the Philippines. I have a friend who loves pandas. She will love this. Plus, this is for a good cause. Pandas!!! I was super super super sad I didn't get to see this when we went to Malaysia last month. I love the idea behind it and I hope people understand that animal conservation is very important! OMG! Cuteness overload! This is a really great way to promote awareness for pandas..I've seen something like this on Thailand but they were bigger but not as many as these! Aww, they're all sooo cute! I wonder if they'll do something like this here in my country. I checked the sched and I hope to be part of one if my trip in May does push through. Lovely photos, by the way. They also had a similar project in Hong Kong during my trip there last year. This is a great initiative in promoting awareness for our cute and cuddly panda friends. Ohhh! I was hoping they would travel the world and come to the US. it would do well and be a visual reminder of conservation here too. Seeing all those pandas in the square is an awesome and cute sight. I hope they make their way to my country too. Or maybe our country can do something like this for one of our own endangered animals. Visit the Philippines.. I have a friend who will love this! i love the concept behind the idea of 1600 pandas visiting Malaysia. We need to take care of pandas, they are so cute!